Scooper - Technology News: We are eating more fish than ever. Can our oceans cope? We are eating more fish than ever. Can our oceans cope? Roughly 90% of the world’s fish stocks are now fully fished or overfished, according to a new report by the UN’s Food and Agriculture Organization (FAO). This means that nine in every 10 stocks are being used at or above sustainable levels – with potentially dire consequences for our oceans and food sources. The FAO’s State of World Fisheries and Aquaculture 2016 report charts current trends in fishing and the possible impact on future generations. José Graziano da Silva, FAO Director-General, highlights “the vital part that oceans and inland waters must play in providing food, nutrition and employment to current and future generations”. The latest report examines the situation across the globe in 2013, and it emphasizes the strain felt by marine fish stocks. 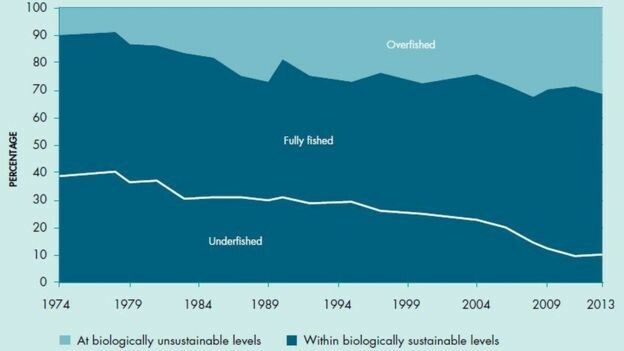 Based on an FAO analysis of commercial fish stocks, nearly a third (31.4%) are thought to be fished at a level that is biologically unsustainable. A further 58% are fully fished – at or nearly at sustainable levels. This leaves just over 10% of stocks underfished – a figure that has decreased almost continually since 1974. Just 10 species accounted for a quarter of the global marine catch in 2013. But with most of their stocks at or above capacity, there is no room to increase non-farmed production. Protecting sea life is vital for the future of our planet. In September 2015, it was announced as one of the Global Goals ( SDG Number 14 calls for the sustainable use of marine resources). 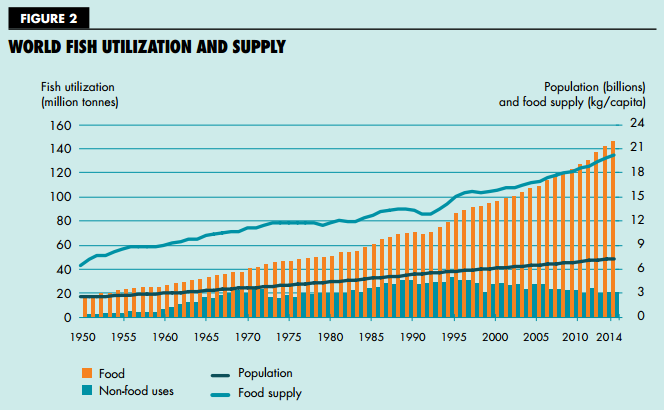 As the global population grows, the availability of diverse food sources will be key to ensuring no one goes hungry. Per capita fish consumption is on the rise: in the 1960s it averaged 9.9kg, and by 2014 it was estimated to have gone beyond 20kg. It remains lower in developing regions, but has been steadily increasing, argue the report’s authors. Meanwhile, an increasing percentage of fish capture is being used for human consumption – as shown in this chart. This growth in fish consumption has “enhanced people’s diets around the world through diversified and nutritious food”, says the report. The world reached a major milestone in 2014, as aquaculture (fish farming) contributed more than wild-caught fish to the supply of fish for human consumption. In contrast, in 1974 it provided just 7% of the total. 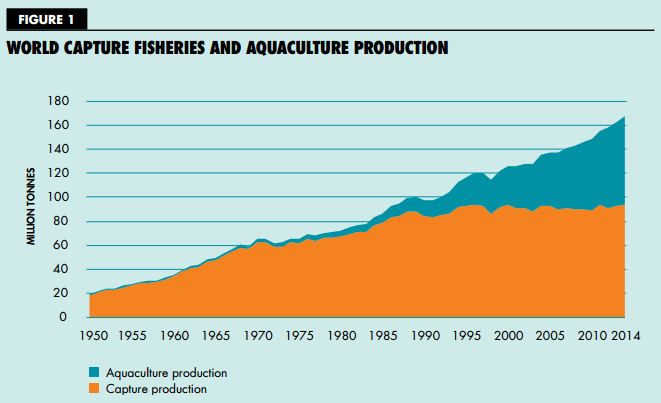 As this chart shows, capture (wild-caught) production has remained relatively stable for the last 30 years. However, there has been a surge in aquaculture. The report argues that much of this growth has been driven by China. It now represents more than 60% of global aquaculture production. Meeting the increasing demand for fish, in a sustainable way, is an enormous challenge. But, as these three charts highlight, awareness and analysis of the problem is key to overcoming it – for the good of generations to come. Have you read? How can we protect our oceans while meeting demand for fish? Here's how we can stop killing our oceans How much plastic is there in the sea?